Apr. 1972 Joined Asahi Kasei Corp.
Mar. 1992 General Manager, Product Development Group, Ion Battery Business Promotion Dept., Asahi Kasei Corp.
Aug. 1995 Manager, Technical Development, A&T Battery Corp.
May 2001 General Manager, Battery Materials Business Development Dept., Asahi Kasei E-materials Corp.
Aug. 2005 General Manager, Yoshino Laboratory, Asahi Kasei Corp. In the development process of mobile devices such as mobile phones and notebook personal computers which have been explosively widespread throughout the world, development of a compact, lightweight, high-capacity rechargeable battery (secondary battery) has been eagerly expected at all times. In 1985, Akira Yoshino solved the problem of the conventional secondary battery and established the fundamental concept of the lithium-ion battery that are widely diffused nowadays. The conventional secondary battery using an aqueous electrolyte had lower electromotive force, leading to a limitation in large capacity. Although a secondary battery using metallic lithium for electrodes with a non-aqueous electrolyte was expected for large capacity, its practical use was not achieved because of problems of safety and degradation. Yoshino established the fundamental concept of the current lithium-ion battery by using lithium cobaltite (LiCoO2) whose possibility as an effective electrode material had been already found at the beginning of the 1980s for the positive electrode, and a carbon material instead of conventional metallic lithium for the negative electrode. In addition, Yoshino developed all kinds of component technologies such as a charge collector and a separator constituting a battery, which realized practical use of the lithium-ion battery at the beginning of the 1990s. The current market share exceeding one trillion yen could not be explained without the fundamental concept Yoshino developed and its impact on the society is immeasurable. For the above reason, Akira Yoshino shall be awarded the 11th Yamazaki-Teiichi Prize in Material. Table 1 shows classification of batteries. To begin with, they are classified into disposable primary batteries and rechargeable secondary batteries. In addition, electrolytes (solutions containing ions) used for batteries are classified into aqueous and non-aqueous electrolytes (which use organic solvents instead of water). Although aqueous electrolytes were used for the conventional batteries, it was impossible to obtain electromotive force over 1.5 V at which electrolysis of water would take place. To realize a compact and light battery, it is essential to increase electromotive force, for that, non-aqueous electrolyte were proposed in 1958. A primary battery using this non-aqueous electrolyte (negative electrode made of metallic lithium and an anode made of manganese dioxide or fluoro carbon) was commercialized very smoothly at the beginning of 1970. On the other hand, needs for a compact and light secondary battery increased since around 1980, and research and development of non-aqueous secondary batteries using metallic lithium for negative electrodes were widely performed, however, their commercialization had hard going. The reason was attributed to degradation of battery characteristic and problem of safety resulting from the metallic lithium used for the negative electrode. In order to overcome the problem, lithium-ion secondary batteries were developed. The lithium-ion battery developed by Yoshino is a non-aqueous secondary battery which uses a carbon material as a negative electrode active material, and uses a lithium-ion containing metal oxide (LiCoO2) as a positive electrode. Fig. 1 shows the battery reaction formula. During charge, Li ions are desorbed from the positive electrode material LiCoO2, and occluded by the negative electrode material carbon (C), and the electrons flow into the negative electrode from the positive electrode by this electrochemical reaction. During discharge, a reverse reaction occurs. Basically differing from conventional secondary batteries, it is a secondary battery with new concept in which only ions and electrons are involved without any chemical reactions. Yoshino's primary achievement is discovery of a combination of positive/negative electrodes for a new secondary battery as shown in Fig. 1. In particular, he overcame the major problem of conventional safety by using a carbon material instead of metal lithium for the negative electrode. Moreover, he realized high electromotive force as large as 4.2 V with the combination of these positive/negative electrodes, introducing to the world a new secondary battery, that is, the small and light lithium-ion secondary battery. Another achievement is development of the electrode structure peculiar to the lithium-ion secondary battery shown in Fig. 2. 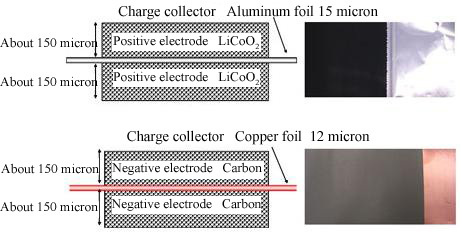 He realized an important battery characteristic of high-output (capable of feeding a big current) as well as the high electromotive force by introducing an electrode structure completely different from the conventional batteries using an aluminum foil (positive electrode) and a copper foil (negative electrode) charge collectors. The development of lithium-ion batteries has realized the small and light secondary batteries. Fig. 3 shows the comparison of the energy density of secondary batteries. Lithium-ion batteries have energy density about 3 times higher than aqueous secondary batteries such as conventional nickel-cadmium and nickel hydrogen secondary batteries on both volume and weight bases, leading to the realization of small and light secondary batteries. Utilization of the lithium-ion secondary batteries has strongly boosted rapid spread of many electronic devices such as mobile phones and notebook personal computers. It accelerated introduction of IT into the society and greatly contributed to the realization of the IT society where you can communicate and obtain accurate information from almost anyplace in the world. In addition, the lithium-ion secondary battery created a new market about 1 trillion yen as shown in Fig. 4. Mankind has major challenges of energy or environmental issues. The lithium-ion secondary battery may have to play more important roles to address the challenges. For example, electric vehicles are being popular and the use of lithium-ion secondary batteries is rapidly advancing, and great contribution to energy saving and environmental conservation are expected. For electrical energy, utilization of a smart grid system incorporating an electric storage device has been tried to efficiently utilize renewable energy. Electric storage device is indispensable to utilize renewable energy such as sunlight, wind power generation with potentially unstable production of electricity, and here too, lithium-ion battery are being counted on greatly. The lithium-ion secondary battery technology developed in Japan is one of the basic technology which broadly supports not only the battery industry but all other industries, and Yoshino's contribution to such state is quite large.